It’s Official: The Peddler’s Bed Book Birthday + You’re Invited To The Party + The Giveaway Winner! Today is the official release day of my debut children’s picture book The Peddler’s Bed, illustrated by Bong Redila and published by Ripple Grove Press! 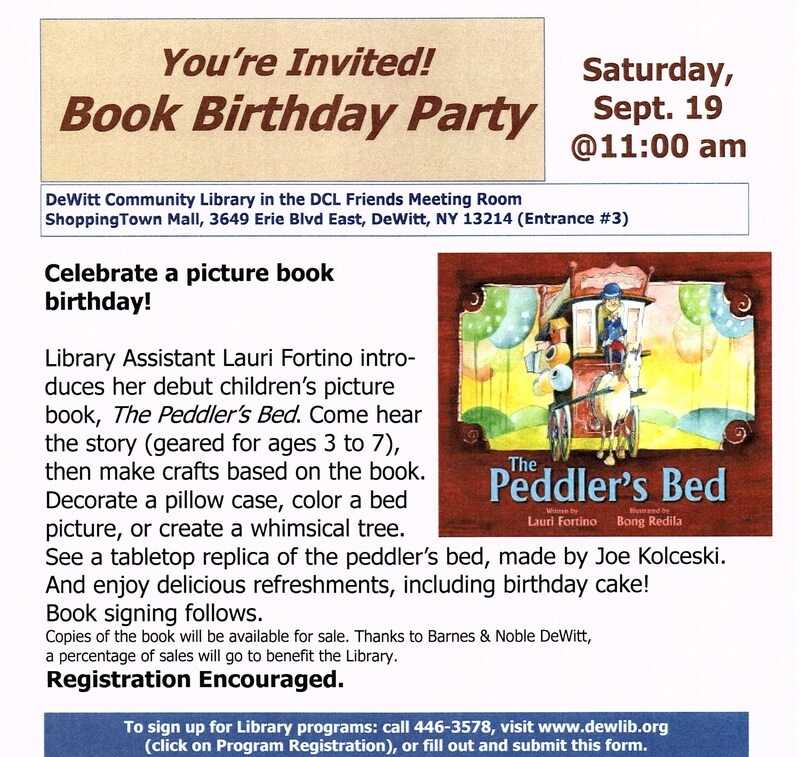 You’re Invited To A Book Birthday Party! What’s the best way to celebrate the launch of a book? You have a birthday party, of course, and everyone’s invited! My publisher, Ripple Grove Press, posted a short profile of me, in the form of an interview, on their website. 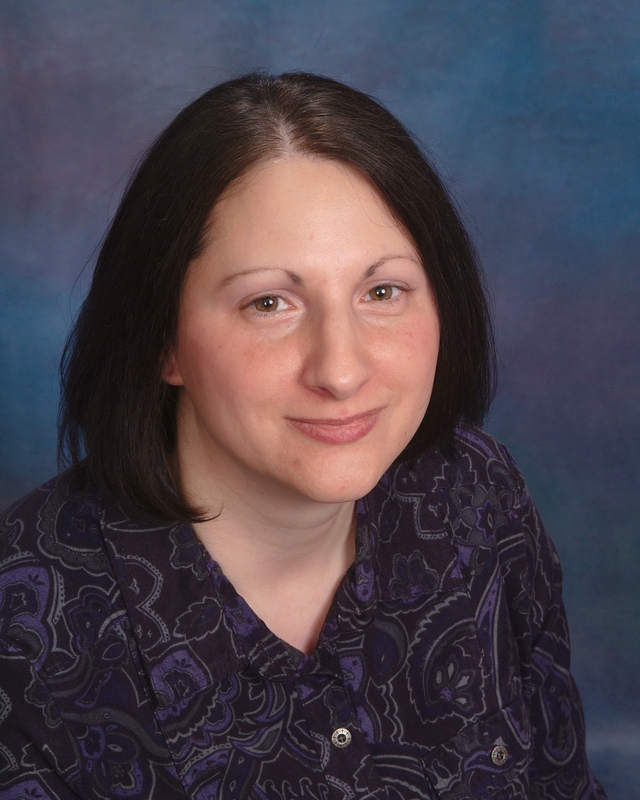 Find out more about me as an author-who my idols are, where I get my inspiration, what my favorite picture books are, and more by clicking on the Key. For every 100 copies of The Peddler’s Bed sold for a period of one year (between Sept. 1 2015 and Sept. 1 2016), I pledge to donate one copy to a U.S. school or public library or to another organization that works to put books into the hands of children. 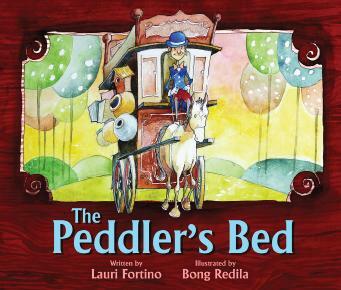 If you are a U.S. school or public librarian or are affiliated with a children’s literacy organization, and would like to receive a copy of The Peddler’s Bed, please use the form on my Contact page to submit your organization for consideration. She is the winner of one signed copy of The Peddler’s Bed plus two blank books to share with an emerging author! Suzanne, use the form on my Contact page to send me your address and the name of who you’d like me to sign the book to–and I’ll get your winnings out to you asap. Thank you to everyone who left a comment on the Emerging Authors post and shared it! Authors feel uncomfortable asking this, but it really does make a difference–those of you who have read or plan to read The Peddler’s Bed, please consider leaving an honest review on Amazon, B&N.com, or Goodreads. I’d really appreciate it. Congratulations, Lauri! Woo hoo! Writing a review of your book is on my to-do list. Congratulations Lauri! Your launch party sounds awesome! Wish I could come! This is spectacular! Congratulations! I hope you enjoy every single second of this experience. Happy book birthday! I sure wish I could be at your book party on the 19th! Sounds like a wonderful time with lots of fun stuff to see and do! Have a great time, and I hope it will be a big success! Good luck, Lauri! It will be great! By the way, we’re ordering the Peddler’s Bed for our school library. It’s on the list! Have fun with everything. This is a special time! I’m sure they will, Lauri! By the way, from Library Tech to another, there just isn’t a better day at work than the day you get to catalog and prepare for checkout YOUR OWN BOOK. I got to do that yesterday for Sophie’s Quest! The best part was that both copies were checked out in the first five minutes of the first class. Today, one little girl dressed in a sparkly owl shirt today and wore an owl necklace, and when I commented on them, she looked me squarely in the eye, smiled, and said, “I read your book this summer.” Does it get any better than that? I feel so blessed–not just being an author, but being a CHILDREN’S book author! My brother gave me the advice to keep a journal of all the fun things like this that happen the first year, because you think you’ll never forget all the special comments, but it’s hard to remember everything. Be sure to do that! What an amazing story! I am very much looking forward to the day I catalog my own book. It’s waiting patiently on the processing cart as we speak. 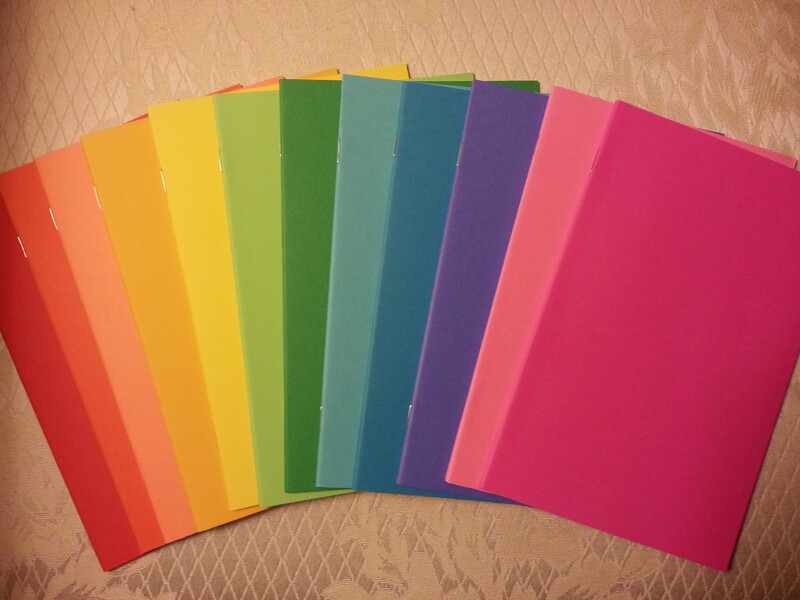 I was considering doing a blog post about following my book through the process, from a library assistant’s perspective. And then seeing my book on the shelves will be a dream come true. And the first time a child brings it up to the desk to check out, I will probably explode with joy. 🙂 🙂 So cool that your book was checked out so quickly. I’m sure those kids will enjoy it; I am!